The words “quirky” and “Board of Regents” do not appear in the same sentence with any regularity. With Ludwig’s Fountain they do. 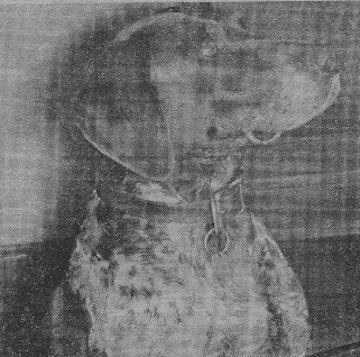 Ludwig was a German Shorthaired Pointer. I don’t know where the Von Schwarenburg came from. Schwarenburg is a line of the German Shorthaired Pointer breed, that’s all I know. 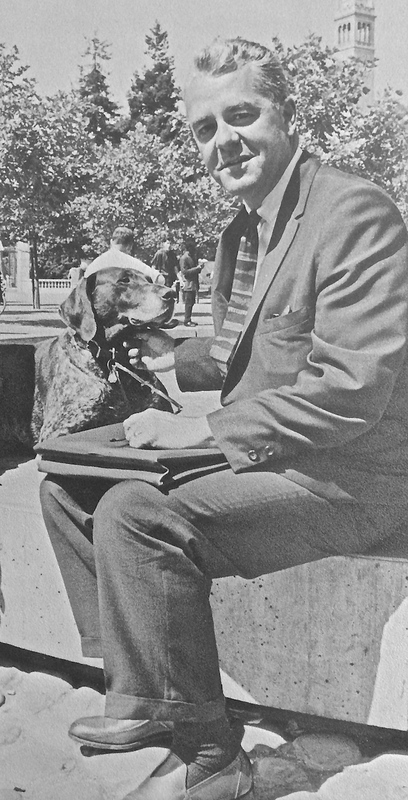 Between 1959 and 1965, John Littleford brought Ludwig to campus every day. As John worked, Ludwig worked the crowd at the fountain between the Student Union Building and the Dining Commons opposite Sproul Hall. Ludwig played in the water, accepted food offered him, and chased balls or frisbees if thrown. At about 5:30 every evening Ludwig left the fountain and went home. I am not sure about the color one, which suggests a Golden Retriever. 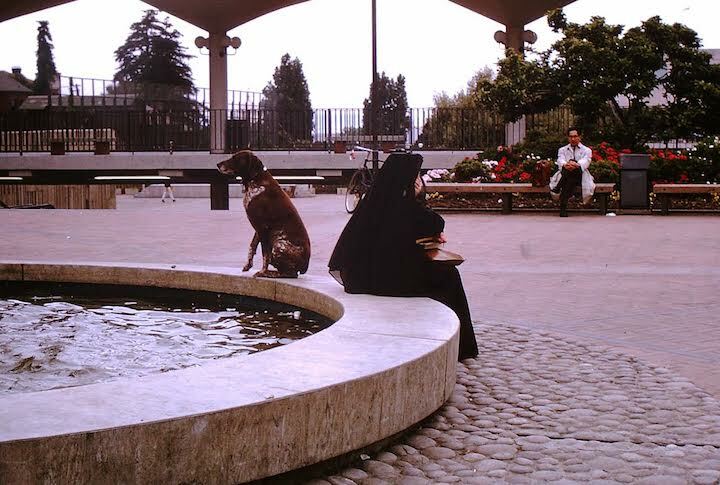 But it is a great photo from another time of the fountain and a dog. Robin Pemantle sent me this photo taken of him with Ludwig in the mid 1960s. This is a photograph of staggering beauty. Thanks Robin. 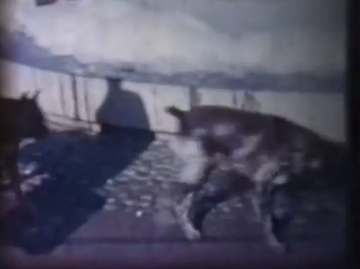 Plus a cameo appearance by Ludwig in a home movie shot by Mehrdad Etemad in 1962, in which Ludwig appears at 3:55 to have a dog follower as he inspects the suds in his fountain. 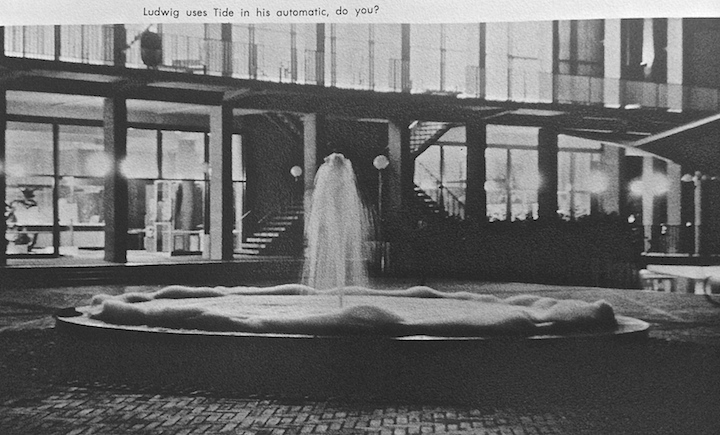 To this day, the story of the fountain and Ludwig are part of campus lore. 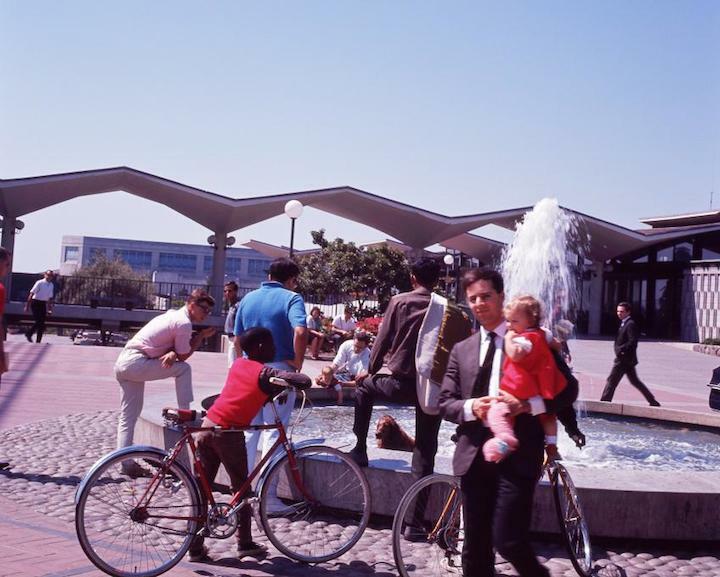 In a 2013 blog in the Daily Californian, Erum Khan wrote that the story of the fountain’s naming was one “we all hear about during CalSO tours.” There is a modest Facebook page about Ludwig. 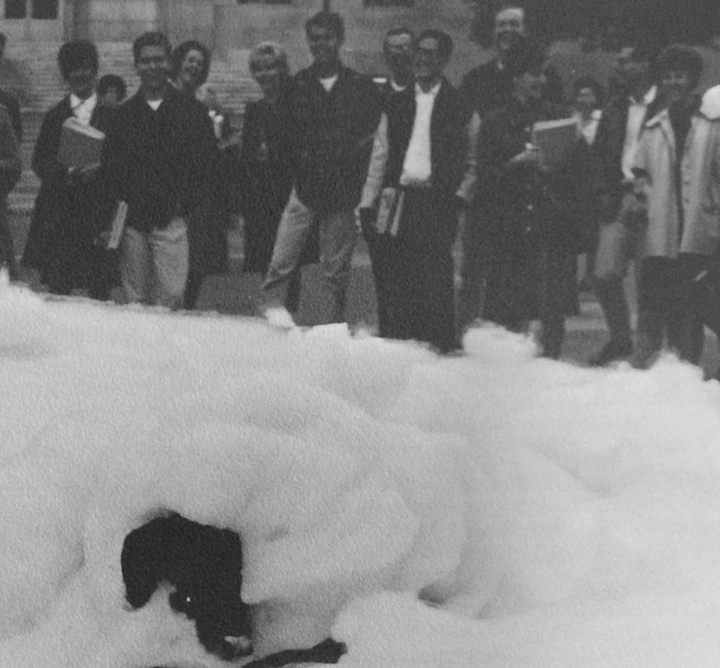 This photo, another sent me by Tom Stetler, shows Ludwig in his fountain during a FSM rally on Sproul. 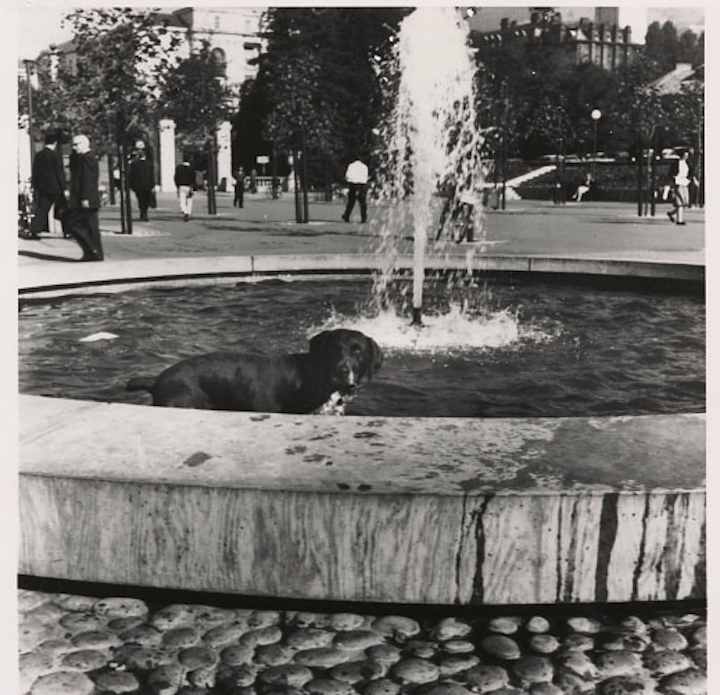 The photo is blurry, but there he is, our dog, the fountain, the rally, the plaza. Ludwig napping during a FSM event. Five years after Free Speech was People’s Park. Ludwig was no longer on the scene, but his fountain was. Here students use the fountain water to rinse tear gas from their eyes. Ludwig would have approved. I have seen a claim in an Associated Press story of August 6, 1965, that Ludwig was almost elected student body head. The Daily Californian of April 17, 1984, further reports that the committee supporting Ludwig for president of the student body (the Ad Hoc Committee for the Transcendentalization and Beautification of Student Government) campaigned for Ludwig arguing that his leadership would usher in an era “in which student government would at last be given the leadership, courage, and depth of vision it desperately needs.” “I Like Ludwig” buttons were very popular on campus. I have seen a claim by W.J. 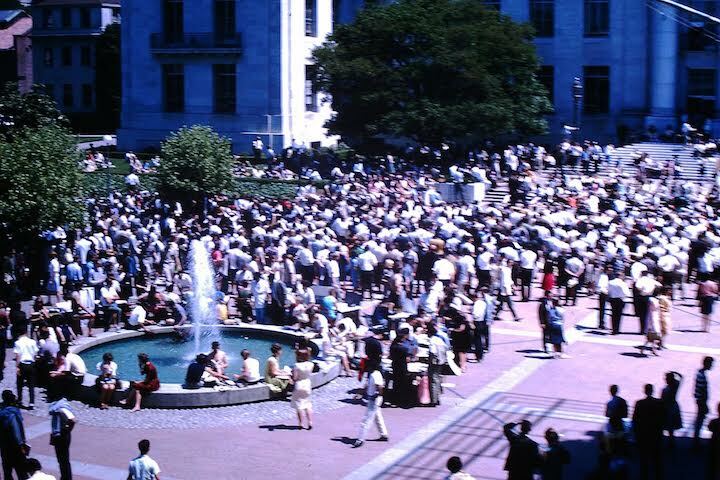 Rorabaugh in Berkeley at War that Ludwig was a faithful listener of Holy Hubert, who preached in Sproul Plaza. When Sargent Shriver visited the campus, he met Ludwig. When Prince Phillip visited the campus, he met Ludwig. Clark Kerr is said to have said “You see who really runs the campus” when Ludwig wandered onto the platform of an all-university conference. 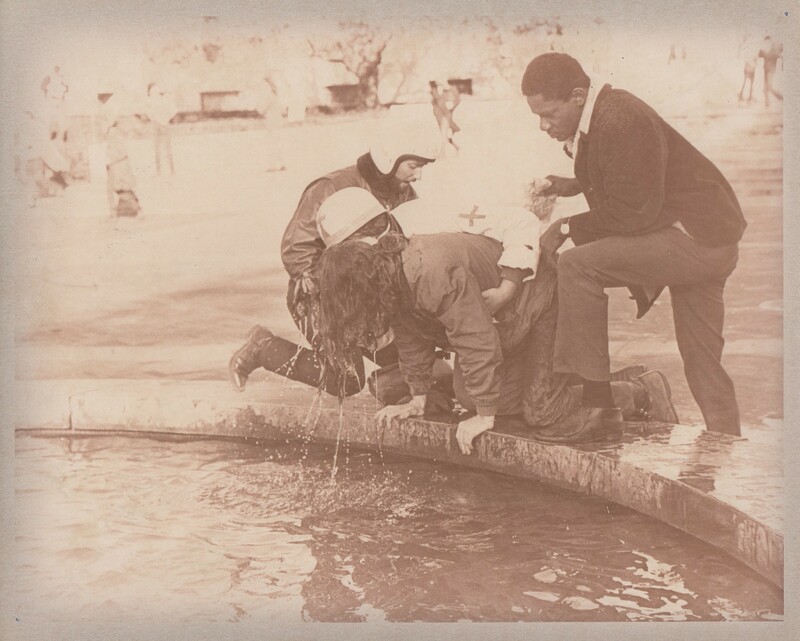 John Littleford moved from Berkeley to Alameda in 1965, Ludwig’s time at the fountain ended. The Associated Press story about Ludwig moving to Alameda was carried in papers throughout the United States. In The Campus Guides: University of California Berkeley, we are told that Ludwig’s portrait was hung in the Student Union and the alumni magazine issued a proclamation naming Ludwig “Friend of the famous, hero of coeds, and acknowledged power behind the University.” “Ludwig Day” was celebrated on September 18, 1965, at California Memorial Stadium when UC played Notre Dame. Student body president Jerry Goldstein led the 70,000 fans in singing “Auld Lang Syne” to Ludwig. 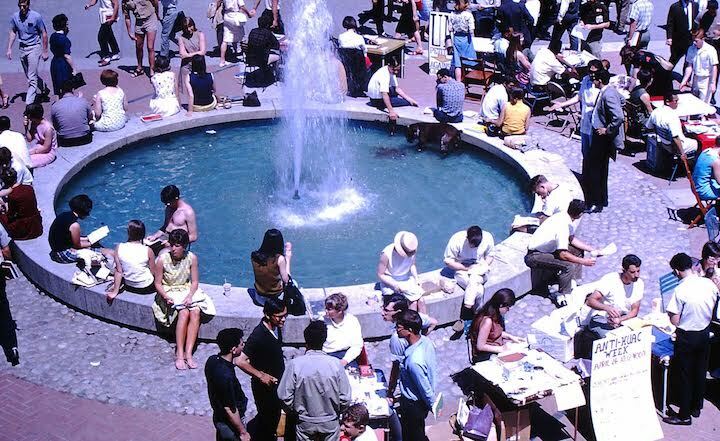 Ludwig lived what Robinson Jeffers called a “good and joyful” life at the fountain. Good for the Board of Regents for this touch of quirk. I showed the photos to my friend. Gabby had just sent him a second carton of Christian record albums. I have been told that this photo I have from when I was a couple years old (1965 or 1966, I imagine) is of me and Ludwig. I don’t see a way to attach it here but I’ll happily send it to if on request. I would love to see it. I emailed you about getting it to me. Ludwig! I attended UC 61′ to 63′ and spent a lot of time watching, talking to and petting Ludwig. 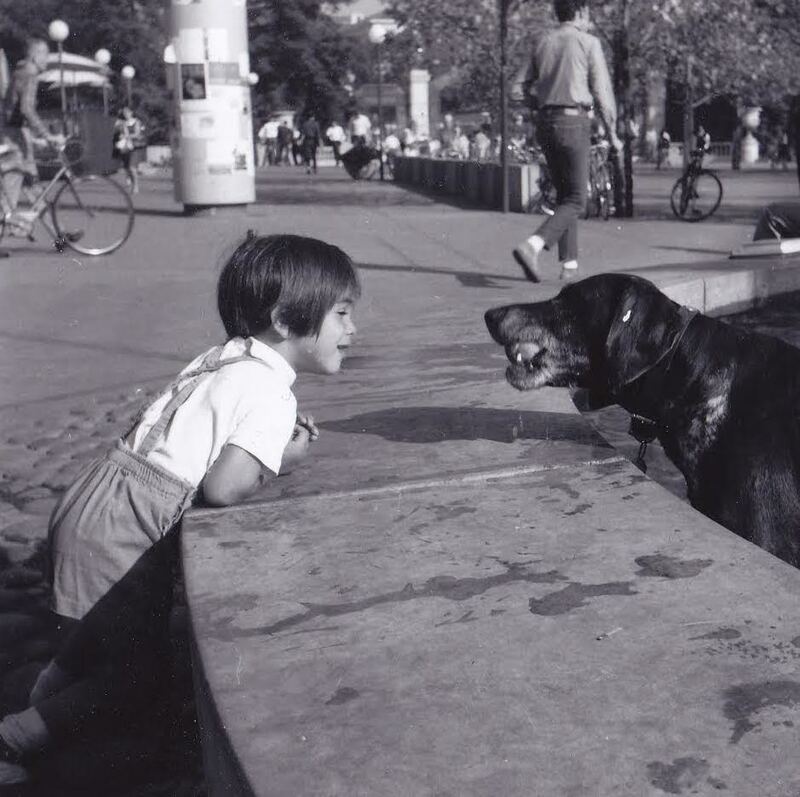 He was there long before “therapy” dogs and delighted everyone. 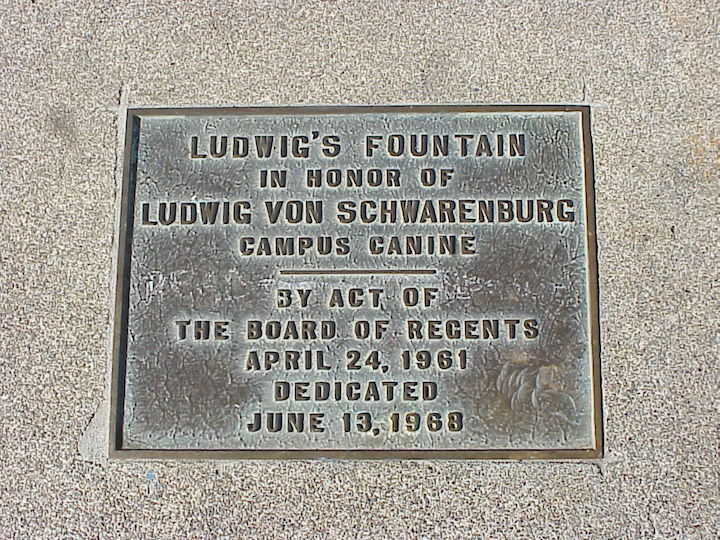 Ludwig was independent and fixed on business as he made the rounds of His fountain. Years later when I returned to UC, he was gone and I missed him. 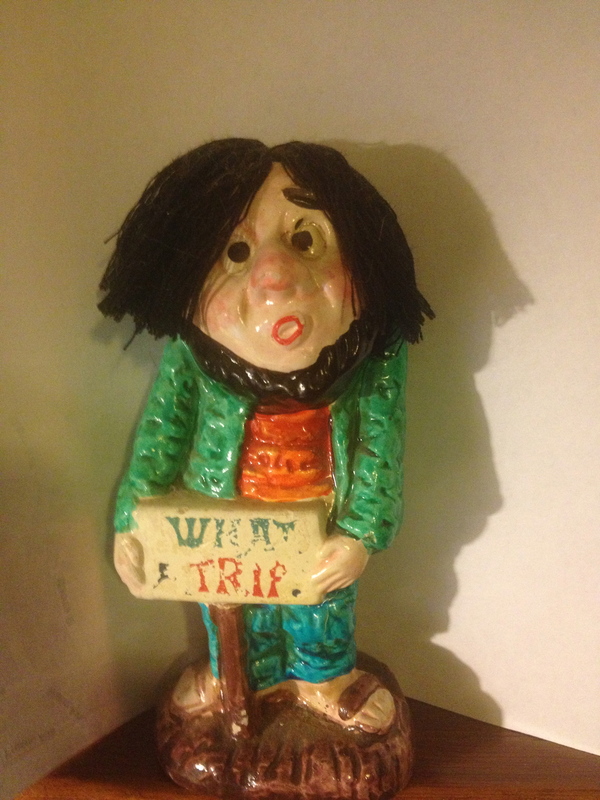 I was a 17 year old freshman in 1964. I remember Ludwig. I notice the story misses one bit – during the Free Speech Movement (in which I was an active participant), someone attached a blue and ubiquitous FSM button to Ludwig’s collar, which he wore for much of the fall semester. 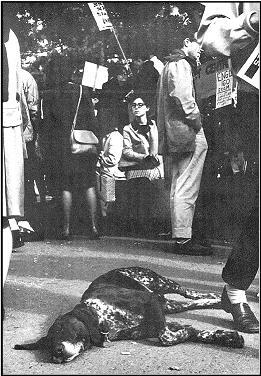 Not directly related, but interesting (to some of us less solemn sorts), was the dog pack that lived on campus, including Ludwig at times. 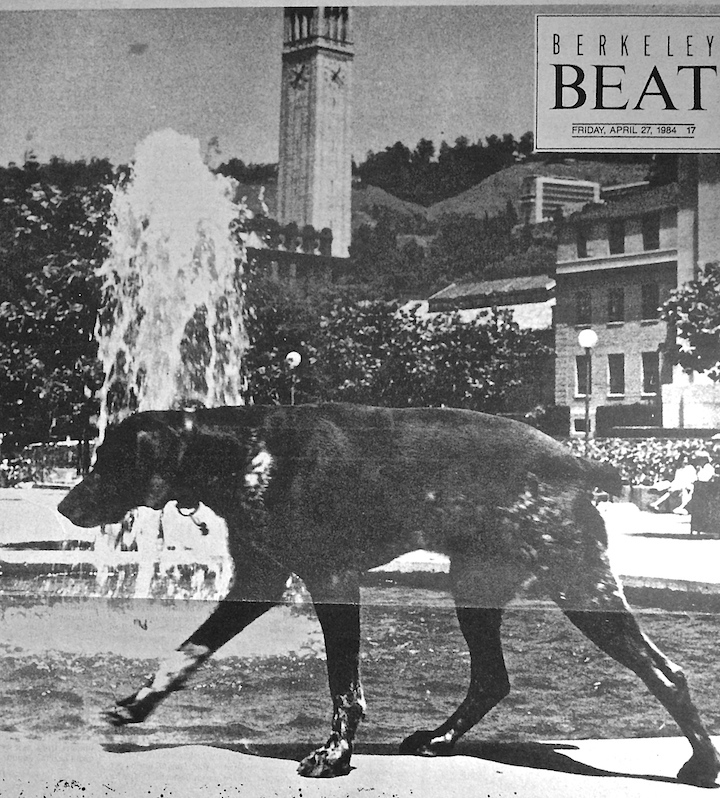 There were numerous mutts that spent the day at Cal, and during warm days, it was not unusual for some of the campus buildings to leave their doors open to get some ventilation. Put 2,500 undergrads in Wheeler Aud (it used to have a bigger capacity before the fire), and it gets hot and funky on a hot day.